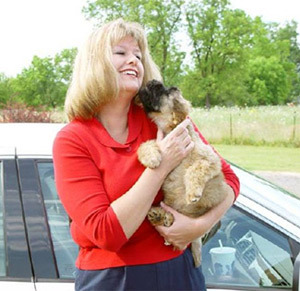 I brought home my first Soft Coated Wheaten Terrier in July 2005. Mack was only 9 weeks old, but he turned our lives upside down. After completing his US and Canadian Championships in short order, Mack went on to compete successfully as a Special, and was invited to the Eukanuba Invitational in 2006. I have traveled on several occasions to Europe to show at and attend dog shows, and to purchase puppies. Mackanme Wheatens, Reg., is located in Gig Harbor, Washington, which is just over the Narrows Bridge from Tacoma, and about 40 miles from Seattle. All of our dogs are registered with the American Kennel Club (AKC). If we plan to show a particular dog in Canada we will also register that dog with the Canadian Kennel Club (CKC). The name Mackanme is registered by AKC and CKC for our exclusive use naming Wheatens. I chose this kennel name because Mack was our first Wheaten and, truly, everything started with Mack an Me!